I hope you are all well sweet Blogland friends. I've got a fresh batch of designs to share with you. 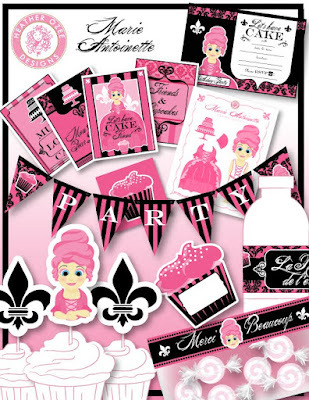 Check out my fun new Marie Antoinette Party Kit. It was a hoot working on this set. I know a lot of people share my love for Marie and her fabulous dresses. Her fashions were my inspiration, along with the amazing hair she sported. 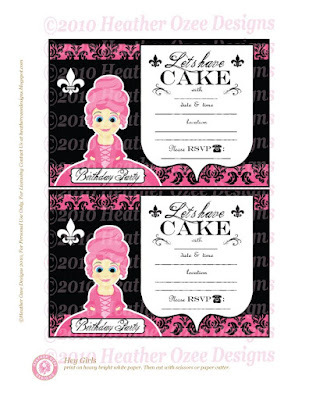 "Let's Have Cake", isn't that a fun play on words and a cute way to start an invitation. If you do your cupcakes just right and pop the Marie topper on it, it will look like the cupcake is her skirt! How fun is that. I could see having my girls and their friends decorate their cupcake Marie's skirt. What do you think? 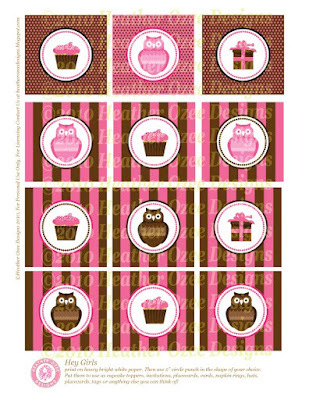 The whimsical cupcake place cards are darling too. 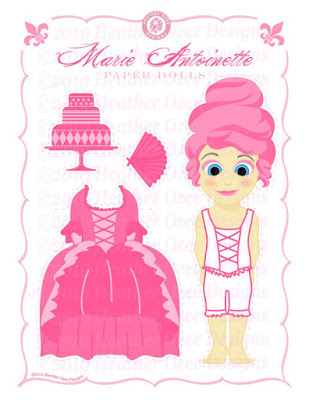 The set also includes this lovely little Marie Antoinette Paper Doll I designed. This is one part of the set where I really got to have fun exploring my inner fashion designer. I have some really exciting design sets on the horizon that are going to be popping with spring colors. Would you like a hint? Batter Up! Hungry, Hungry.... (You know that fun game the kids love to play) What will you See under the Sea? So there's three hints for three upcoming sets. I've been amazed at the amount of Pin The Beak on The Owl's I've been selling for the past two weeks. This little bird has become quite popular. The cupcake toppers are one of my favorite sets. I'm always won over by anything pink and brown, so I truly enjoyed doing these. 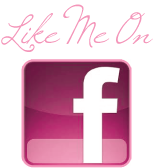 Check out this fun crafty Link Up Party! Well there's a lot going on around our home. 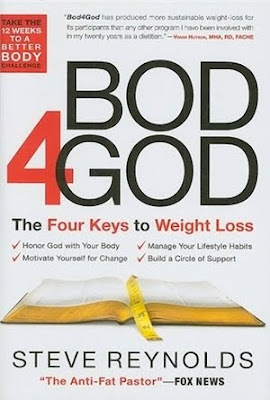 We started the baby steps towards changing over to a healthier lifestyle. The little one's began gymnastics classes. I began taking a class at church based on the book Bod4God. We switched the Little Debbie Snack cakes for granola and apples. And guess what, no one died with out their junk food. We also enjoyed a fun Hollywood Themed Birthday Party with friends last weekend. The girls got decked out in feather boas and sunglasses to go to the movies. We saw Gnomeo and Juliet. It was a wonderful movie. Full of good laughs. 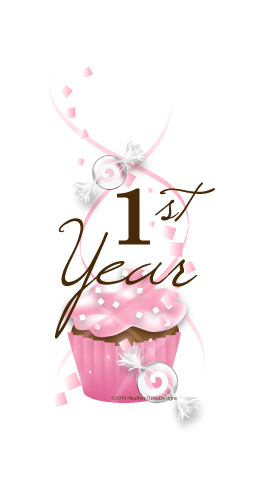 It's my 1st year in business! Wow how I've been blessed. Both in making new friendships through my business and in growth. To celebrate I'm doing a giveaway. 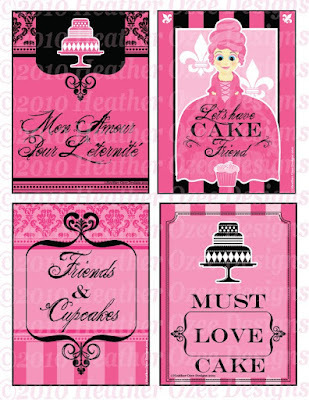 Simply go to my etsy shop Pick which printable design is your favorite. 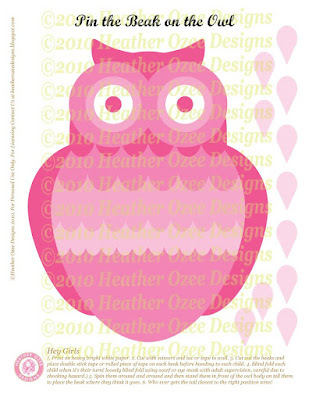 Then return to my blog and make a comment mentioning which design you would want if you won. Super easy. I'll announce the winner Next Friday and send the files by email within 72 hours of that announcement. I had a girl friend ask me to design her little girl's party set. She wanted a focus on all things Hollywood and Glamorous. Well, it's almost complete and the package will be available soon in my shop. I have to say that I think this will be my new favorite. It has a super fun, and very unexpected activity to go along with it for the kiddos. I can almost guarantee that they haven't done this at a party before. 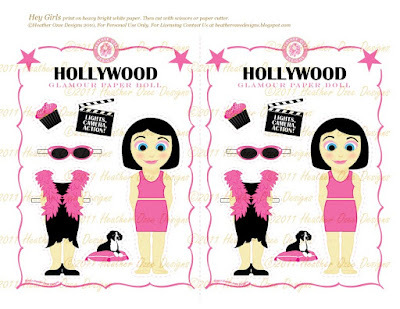 And the cupcake toppers are sure to please any young starlet! So here's a peek at the paper dolls that will go with this set. One thing that will be different about this Party Package is that it is only available customized. Meaning that the package will include a name and age on the cupcakes, name on the banner, and the invitation information will be filled in by me. It truly brings the big production feel to the party favors. Can't wait to show you more.